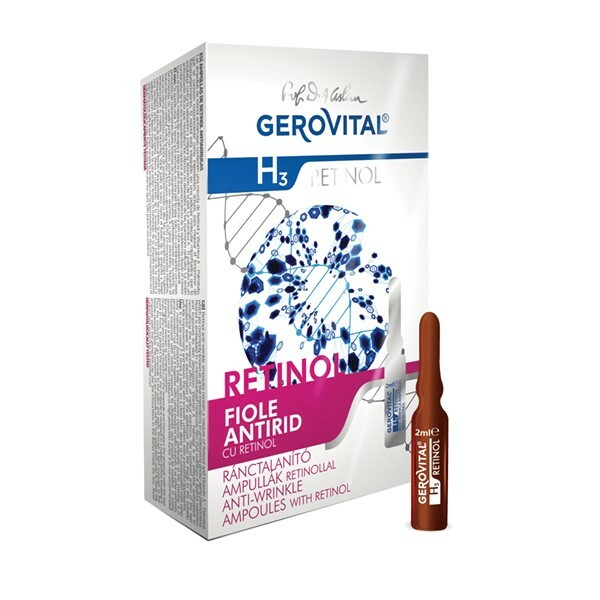 The Gerovital H3 Retinol vials fights the signs of premature aging caused by environmental aggressive factors, especially UV rays. Powered by two non-irritating actives, microencapsulated Retinol and Vitamin A-Palmitate, the vials leave the skin smooth and renewed. Rejuvenates skin from the inside, firms facial contour, softens fine lines and wrinkles, unifies skin tone, leaving a fresh, youthful look. Retinol - Thanks to microencapsulation technology, this type of retinol penetrates deep into the skin, delivering superior results. Fights photo-aging, reduces the appearance of fine wrinkles, lightens darken spots, improves skin texture. Vitamin A-Palmitate - An effective antioxidant in neutralizing the unwanted effects of radical reactions. Improves collagen production, helps reducing fine line and wrinkles. Usage: Apply 2-3 times per week, preferably in the evening, on a clean face, alone or in association with other daily maintenance products. Break the serum ampule using a tissue paper or textile towel. Pour the content into the palm of your hand and apply it on your freshly cleaned skin by gently massaging it. Once the serum is absorbed apply your face cream. Safety warning: It is not recommended to be used in association with other Vitamin A products or with other retinoids. During the treatment with retinol avoid exposure to UV rays. For daytime, follow with a medium or high broad-spectrum SPF product. Apply 2-3 times per week, preferably in the evening, on a clean face, alone or in association with other daily maintenance products. INGREDIENTS: ISOPROPYL ISOSTEARATE, CYCLOPENTASILOXANE, C12-15 ALKYL BENZOATE, UNDECANE, TRIDECANE, DIMETHYL ISOSORBIDE, DIMETHICONE, ETHYLHEXYL COCOATE, DIMETHICONOL, TOCOPHEROL, RETINYL PALMITATE, GLYCINE SOJA OIL, HELIANTHUS ANNUUS SEED OIL, THIOCTIC ACID, HYDROGENATED PALM GLYCERIDES CITRATE, RETINOL, DIMETHYLMETHOXY CHROMANOL, BHT.